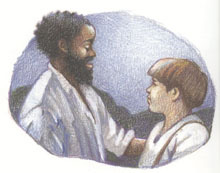 "Children's eyes will grow wide as they listen to this true story of how Allen Jay helped a passenger on the Underground Railway escape from slavery in 1842. Narrator Jay Sanders brings social studies to nail-biting life, whether documenting details of daily life at that long-ago time or building the suspense of how the main character finds the runaway slave and helps him to safety. As children hear Sanders's quiet but suspenseful storytelling, they will put themselves in the place of young Allen: would they be able to act as bravely? Light sound effects-the crackle of dry leaves, horse hooves falling on a road-further enhance this powerful drama."